Conor is swimming towards a paralympic dream! Posted on August 14, 2017 at 7:38 am. 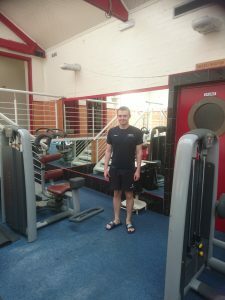 Conor is 25 years old and currently works as a leisure attendant at Templemore Swim and Fitness Centre, Belfast. For as long as he can remember Conor has had a passion for fitness and the leisure industry. Upon leaving school he attended work placements at Queen’s PEC and Templemore Baths and with the help of Orchardville’s employment service he secured part time paid employment at Templemore. A referral to Workable NI (WNI) then followed and with the support of his Employment Officer, Conor gradually increased his weekly hours and now works full time at ‘the Baths’! Conor has made huge progress during his time on the WNI programme with Orchardville. He recently completed a Swim Instructors Level 1 course and can now teach swim classes with assistance from colleagues. He is keen to complete his Level 2 but at present it is unavailable – that will remain a goal for the future! Instead, he has decided to expand his industry knowledge and with the support of his Employment Officer has enrolled on a fitness instructor’s course at BMC. This will allow him to teach exercises classes and provide one to one personal training. The ongoing restoration of Templemore Baths means the Centre will be providing a much more diverse fitness programme that will give Conor greater variety in the classes he can teach. Workable NI has provided Conor with consistent and ongoing support at work enabling him to overcome many of the barriers initially posed by his learning disability and autism. Regular support sessions with his Employment Officer have helped Conor adapt and continue his development in work, while outside work a newly found confidence means Conor regularly socialises with others at Orchardville’s various social clubs. The support of WNI has been invaluable in allowing him to work successfully at the same level as his peers. Conor says, “Workable has really helped me. Without it I probably wouldn’t be working and if I was it would probably be a job I didn’t like as much and I wouldn’t be as good at it”. Swimming has always been one of Conor’s passions. He has had an extremely successful competitive swim career, competing and winning in venues across Europe. He is currently in training for the 2020 Paralympics in Tokyo, Japan where he hopes to represent Team GB at the games. Yet another goal for Conor that we’re sure he’ll reach!